La Dolce Vita by the sea, on Italy's Amalfi Coast. About an hour and half to two hour drive on a good day from Naples, or roughly 75 minutes by ferry from Salerno, Positano is truly the gem of the Amalfi Coast towns and the one with the most famous views. It was a retreat for Ancient Roman emperors, a town named to honor Poseidon himself, and became the happening place midcentury by stars like Elizabeth Taylor. What is it about this place that draws people into its beachy thrall? Quite simply: it's a heck of a charming town that is small enough to let you breathe but with just enough to keep you entertained. We stayed a bit up the hills from the beach at Villa Palumbo B&B, easily reached along the Intra-Positano Bus system with rooms at a reasonable price. We stayed in a Superior Balcony Double, which was quite spacious by European room standards and had a lovely view of hillside buildings. Each morning, we could take breakfast in our room or up on the patio, which was quite a spread of coffee, cappuccino, or juice, thin slices of crispy white toast, warm croissants, some delicious sort of chocolate bread loaf, cornflakes, and small place of deli meats and cheese, all served with butter, various fruit jams and Nutella. The villa owners were nice and very helpful, giving us beach towels or umbrellas as needed and maps of the area. 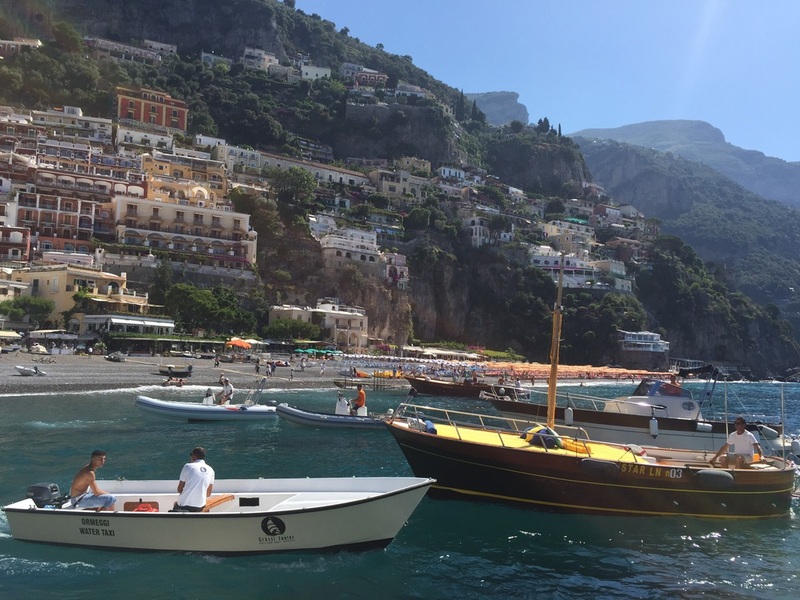 If budget is important, you could stay in nearby Sorrento and take the SITA bus along the twists and turns of the cliffside road into Positano, which will set you back only a few bucks, or stay in the less touristy Salerno and ferry in via TravelMar for 12 Euros. If you plan on heading elsewhere in Italy via rail, this makes Salerno an even more ideal option as the Freccia high speed lines do serve the area via Salerno station, as do other rail lines. One of the most important things to understand about Positano is that you will at any given time be going up and down steps; a lot of them. 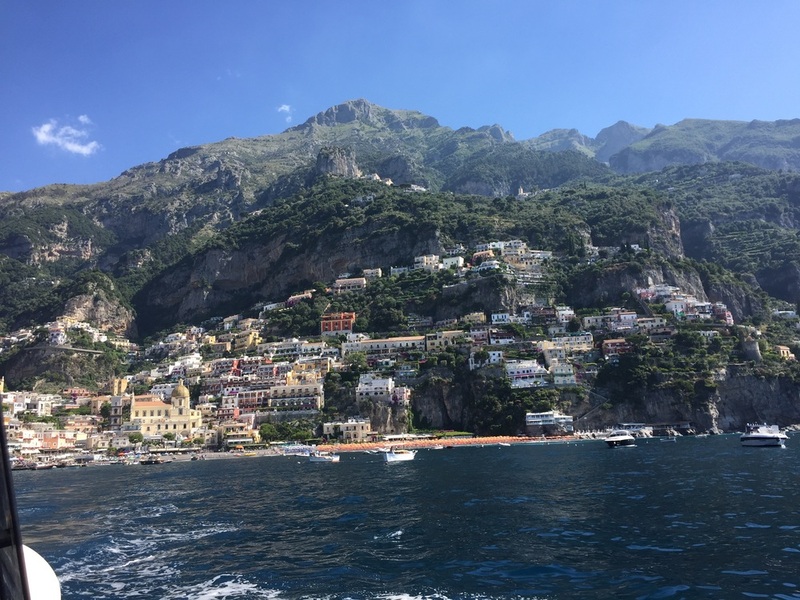 Even with the help of the almost roller coaster-like Intra-Positano bus, this is a town built steeply on hills and cliffs and it will let you know it so gird your calves. Dotted along the few streets are restaurants, cafes, shops selling clothing or leather sandals (a cottage industry for the area) or ceramics, and it is very clearly a town that knows it's a tourist destination. You will not find the best gelato in Italy here, but you can get a perfectly decent lemon risotto at places like Buca di Bacco or some great seasonal fair at the ever popular Da Vincenzo. If you're into smoothies and clean eating then fear not, Casa e Bottega will be heaven for you. But if you have the cash and really want an incredible view, Le Sirenuse hotel's restaurants and bars are the place to be. Just make sure to make reservations ahead of time. But, in the grand scheme of things, people flock to Positano for the small stretch of rock pebble beach, Spiaggia Grande. For 10-12 Euros, you can rent a chair and umbrella all day from one of the beachfront bars like L'incanto, which also gets you use of their changing rooms and bathrooms. As the beach isn't very public, you quickly learn to just part with the money and then sit back and relax and take a dip in the beautiful blue waters, which were surprisingly warm enough in mid-June. As there are restaurants and snack bars right on the beach, it's very easy to make this a whole day affair but believe me when I say this: sunscreen, sunscreen, sunscreen. Do not make my mistake and spend the rest of your trip with skin redder than a lobster. Apply early and often. And, as this is a rock beach, invest in a comfortable pair of foam flips you don't mind wearing in the water or water shoes. Your soles will thank you. Once you've had your fill of lazing about the shore, you can rent one of the many rubber boats and cruise along the water or take the ferry to Capri for a couple of hours. If hiking is your thing and you're feeling brave, then the Path of the Gods is the walk for you along the cliffs of the coast. Or, if you really do love stairs, you can try the famous 1700+ stairs to Nocelle up above Positano. Bring a lot of water. By the end of the short time we were there I was sunburnt, my legs were aching fiercely from climbing up so many steps and ramped streets, and if I could I would absolutely do it all over again. A day and half was too short of a time, and not long along to explore more of the region. But as we watched the sunset along the beach and the town light up at night as the bus sped along winding streets, and from the top of Viale Pasitea we could see the beach below glowing under the full moon as the lights twinkled...it made the little discomforts worth it. 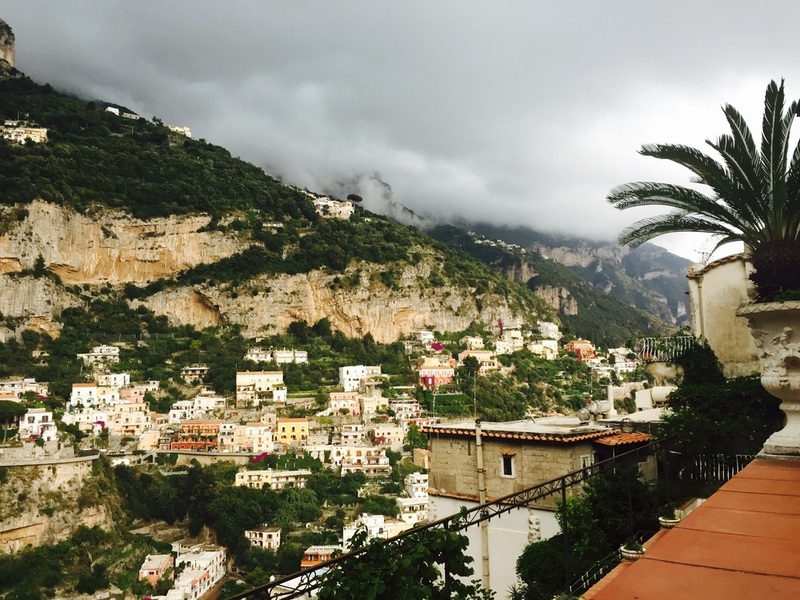 If you're thinking of visiting Italy, keep Positano in mind. Via rail, it's easy to get to from other major cities like Rome and Florence, and it's a beautiful, worthwhile stop for any weeklong trip. Positano does indeed bite deep, leaving you longing for its tranquility well after you've left.